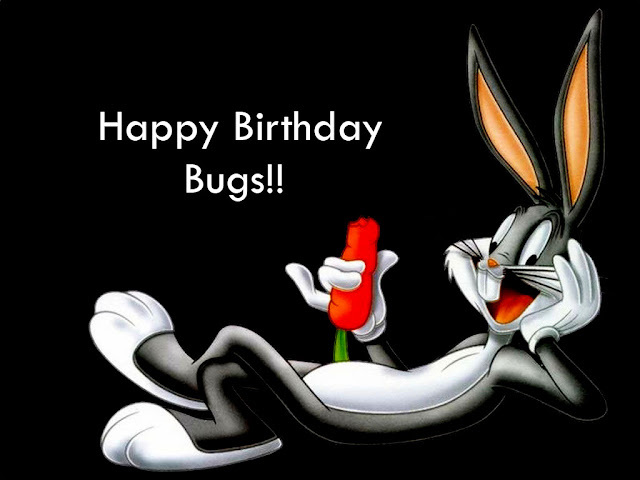 RETRO KIMMER'S BLOG: HAPPY BIRTHDAY BUGS BUNNY IS 75! Versions of Warner rabbits began appearing with 1938’s “Porky’s Hare Hunt.” They didn’t sound, or look like, what became Bugs. In “A Wild Hare,” Elmer Fudd utters his classic line, “SHHH! Be vewy, vewy quiet. I’m hunting wabbits.” In this short, Bugs first delivers his famous catchphrase, “Eh…what’s up, doc?” Bugs, whose name officially is said on-screen in his next film the following year, “Elmer’s Pet Rabbit,” quickly became one of Hollywood’s biggest names. People would go to the movies to see Bugs…the film itself came second to him. That was only the beginning. Over the course of his career, Bugs has encountered and bested the likes of dogs, ducks, World War II enemies, Martians, Tasmanian Devils, in-ter-esting monsters, and many others. He’s also starred in operas, conducted orchestras, and shared screen time with all of classic Hollywood’s A-list stars. He’s headlined his own TV series and his star continues to shine to this day. A 75- year–and counting–career. How many other actors can say that? Read more..